Bubba Thomas? The 16th hole at The Waste Management Phoenix Open brings more excitement on Friday, this time with a super bowl twist. The Famous “Bird’s Nest” at TPC Scottsdale is known for fan shenanigans and even caddy races but this year Bubba Watson brought the party to the fans. 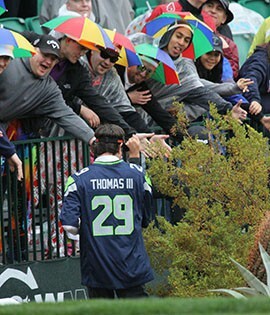 After his tee shot on 16 Bubba put on an Earl Thomas jersey from the Seattle Seahawks which brought about a mixture of cheers and boos. What’s surprising is that Bubba decided to do this two days before the actual game and while he was only one shot behind first place. After he put the Jersey on and the fans reacted Bubba took it off and threw it into the crowd for a lucky fan to keep. “My thing this week is I’m going to put out some jerseys…I always throw out something…with these fans it’s easy…it’s once a year it’s pretty simple to give away a couple things,” Watson said. Bubba said he knows some people in the Seahawks organization and plans to give away more jerseys over the next couple of days. With Bubba during this stunt was partner Billy Horschel, the two threw out their personal visors along with the jersey, which led to fans living up to their 16th hole rowdy reputation. “The atmosphere here is great, it’s one week out of the year, if it was every week we would get tired of it…we don’t want to get booed that many times,” Watson jokingly said. Bubba wasn’t the only one to receive a reaction; Tiger’s appearance is one to be remembered. As Tiger walked up to the 16th tee box he was greeted by a group of fans wearing skull masks, imitating the disguise he wore when he surprised girlfriend Lindsey Vaughn, at her record breaking ski run in Italy. Aside from the crowd on 16 Tiger said it was nice to have so much support from the fans for not only him but also the other golfers in his group. 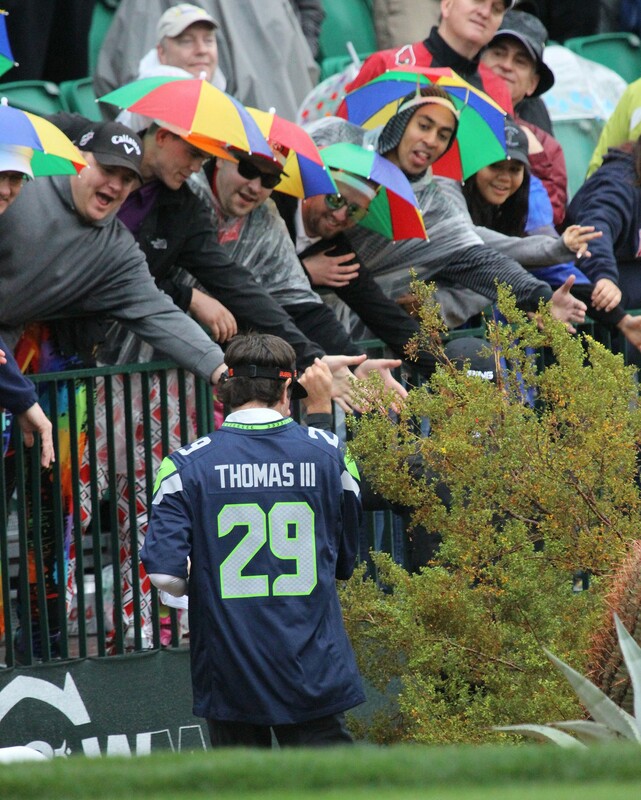 Bubba Watson hands out visors to fans while wearing the Seattle Seahawks’ Earl Thomas III’s jersey while walking down the fairway at the 16th hole.